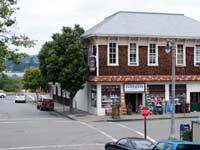 Waterstreet Hardware has been serving Sausalito for over 35 years. The store is reminiscent of old fashioned hardware stores found in any small town of years past. Waterstreet is independently owned and the only remaining hardware store in town. The store is a charmingly cramped, one stop shop for home repair enthusiast, builders and boaters. You will find a floor to ceiling ladder which runs on a rail in back of the store to get to the hard to reach items. A place where you can buy nails by the pound from the revolving nail bin and purchase individual nuts and bolts in what seems unlimited sizes. In most cases, if you need it Waterstreet Hardware will have it. is located in what was once Sausalito's school house. Central School opened in the early 1890's and served Sausalito until 1926, when the two story structure was moved a half a block down the hill to its present location on Caledonia. In certain areas of the store, a vibrant red carpet which seems out of place in a hardware store and seen better days, is a reminder that the space was once a pool hall. A miner panning for gold, carved out of wood by a local artist is wheeled out each day to welcome customers. The carving was presented to the store with a sole request by the artist to place it by the entry way each day. Most people walk by the miner not paying it much attention since it has been located at the front door for what seems like forever. However, the miner still captivates children's curiosity and they like to reach out and touch the miner on the arm or back. There are many gold nuggets in the store's history. A ninety-eight year old customer recently told a sweet story of how she went to school in the building in the early 1900's. The boys went up the stairway on one side and the girls marched up on the other side to get to the second story classrooms. The store is a place where employees know most of the customers by name and locals can hunker down on one of the stools by the counter to discuss a house or boat problem needing fixing or just pass the time. It is not unusual to overhear a customer offer a remedy to another customer for a perplexing problem. Waterstreet, as it is referred to by the locals is a special place. In many ways, Waterstreet is more than just an old fashioned hardware store.